Hand gestures are an integral part of communication, particularly if we are speaking in a foreign language. They are a great way of making sure we’re getting our point across and underpin what we’re trying to say. 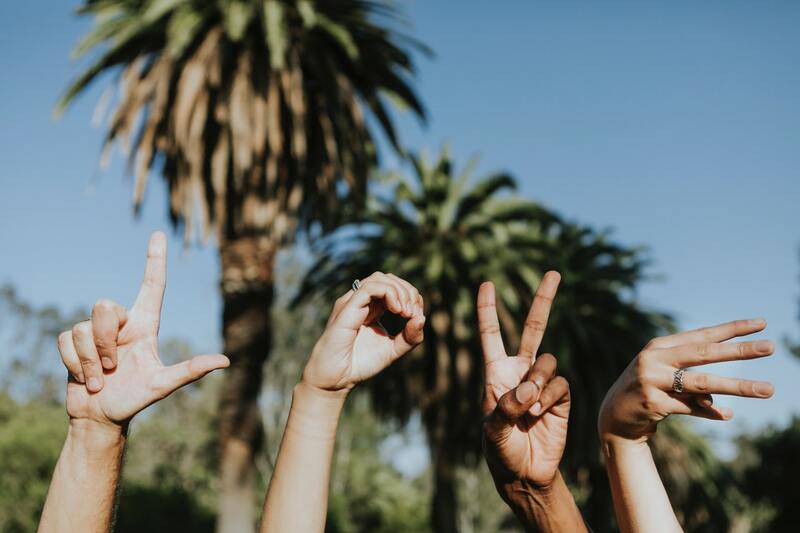 Many travelers will also use hand gestures as a means of non-verbal communication when traveling in countries where they do not speak the local language. Be aware though – not all hand gestures have the same meaning in all countries! It is worth looking into different hand gestures when you learn English online, so you are one step ahead of the game. Not understanding the meaning of gestures in different cultures can lead to misunderstandings, insults and even violence. However, since hand gestures are such a regular part of our daily communication habits, it is easy to make a mistake. US Presidents George W Bush and Richard Nixon both unintentionally insulted their audiences in Australia and Brazil by flashing commonly used American hand gestures, not knowing that the meanings were drastically different. 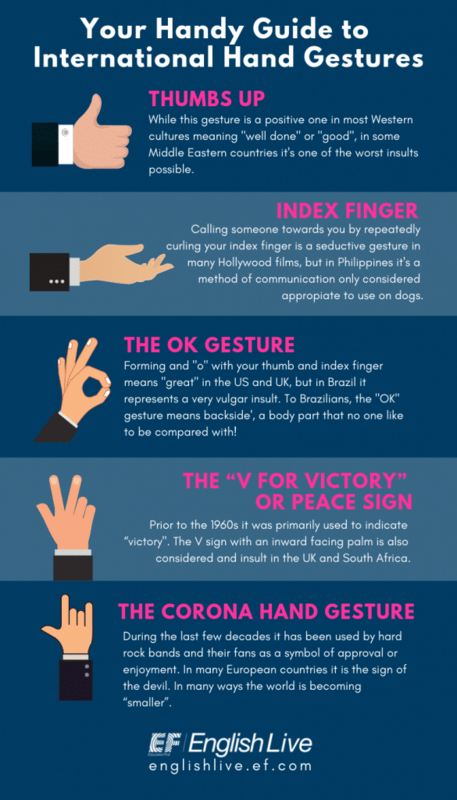 Check out our handy guide to hand gestures and make sure you don’t accidentally insult anyone on your next holiday or business trip. Thumbs up is perhaps the most common of hand gestures and one that has been used for thousands of years. The signal for approval or agreement is commonly found a European and American cultures as a sign of approval or that things are going according to plan. The gesture is so prevalent that it is a common emoji and is commonly used in social media and customer service ratings to indicate satisfaction. However, in many Islamic and Asian countries it is considered a major insult. In Australia, the gesture also means all is fine, unless the user moves it up and down which transfers the gesture to an insult. The thumbs down gesture is also commonly used in America, but less so in many other countries. The gesture obviously means the opposite of “thumbs up”, however in many cultures it is considered to be very rude and arrogant. However in many countries outside of the US the direction the palm is facing makes a major difference in the meaning. The peace sign is the one that caused George W. Bush some problems when he flashed it to an Australian crowd with the palm facing inward, which is a major insult. The V sign with an inward facing palm is also considered and insult in the UK and South Africa. 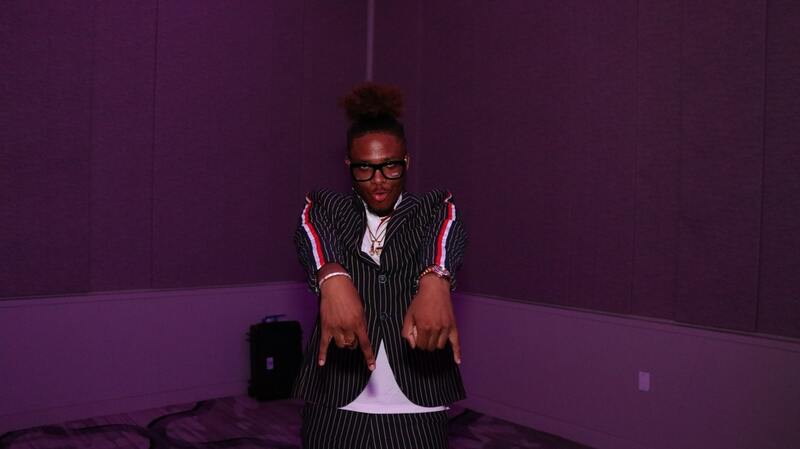 The OK sign, which is made by curling the index finger over the thumb and extending the other fingers above them, is another fairly common hand gesture in America and most of the English-speaking world meaning that everything is going well and according to plan. It is also regularly used by divers to indicate that all is well to their dive partners. However, in Latin America, the gesture is considered to be extremely rude as Richard Nixon discovered after flashing it to a large crowd of Brazilians awaiting his arrival in Rio de Janeiro who responded to his greeting with a chorus of “boos”. In France the gesture is also considered an insult; in Australia it means “zero”, in New Zealand the user is basically considered to be lazy. In the US and some other English speaking countries curling the index finger toward the palm of the hand is used to summon someone towards you. In movies the gesture is frequently used by a female character as a way of tempting a man. However, in other countries this gesture is also called the dog call and as the name implies should not be used to summon humans. Using the gesture in the Philippines it is one of the most offensive gestures that can result in the user’s arrest of even having his finger broken as a punishment. The Japanese also consider the gesture to be rude. In Singapore the gestures is used to mean “death”. This gesture which consists of the index and little finger pointing upwards and the two middle fingers curled toward the palm has a wide variety of meanings. During the last few decades it has been used by hard rock bands and their fans as a symbol of approval or enjoyment. In many European countries it is the sign of the devil; whereas it is a positive sign in both Hinduism and Buddhism. The sign is used to indicate that one’s spouse is cheating on them in Italy, Brazil, Cuba, Spain and Portugal. In many ways the world is becoming “smaller”. People are far more mobile than at any time in our history. Both business and personal travel are increasing. Additionally, virtual conferences and meetings using platforms such as Skype or GoToMeeting are increasingly a part of daily business life. This means that more and more people are communicating with those in other cultures. It is important to avoid offending others when traveling. Whenever you travel for business or pleasure to another country spending a bit of time to research the culture and especially customs such as non-verbal communication is a wise use of your time. It could mean the difference between a fun, productive trip and one that is possibly far less pleasant. The 3 most awkward English learning videos ever!